Isabel - vda. de Ramos de la Vega: You'll see... We'll be eaten by mosquitoes and bitten by lions... I think this is a nonsense. Marisol is a film star with man trouble . 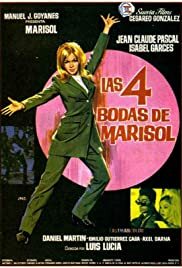 A precursor to the current RUNAWAY BRIDE problem, Marisol plays a film star and singer called "Marisol" who keeps getting engaged but never follows through. When her latest engagement is announced to the media, jilted lovers come out of the wood work making prior claims. Marisol can't seem to make up her mind and her performance is extremely pretentious. This was either a sign that the grown-up Marisol had lost her ability to play it natural or her interpretation of a vain movie-star had such convincing affectation as to be unlikeable. One suspects the real person had changed and in any case and the child star had become a stunning beauty still easy on the eyes. In the best scene (without a song), Marisol, having committed to marrying a British Royal, gets to meet The Queen. Asked what she most wants out of life, she asks to have Gibraltar back! The screwball elements and bad editing make this a sloppy enterprise not surprisingly still missing on DVD.